"When leaders fail to confront conflict, they become the 'biggest elephant' in the room." In a survey of more than 4,000 CEOs, executives, and managers, more than 90 percent admitted they were uncomfortable confronting or engaging in conflict. Yet leaders must realize that every conflict presents an opportunity to reach higher levels of performance. 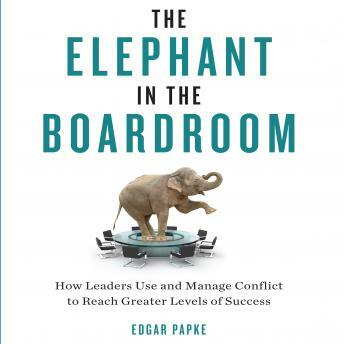 In The Elephant in the Boardroom, award-winning leadership psychologist Edgar Papke explores the unique and challenging relationship that leaders have with conflict, and offers the know-how needed to use conflict as the engine of innovation and creativity. As a result, you will learn how to act courageously and be better equipped to lead and win in today's complex and turbulent world. -Better understand the unique relationship leaders have with conflict. -Gain the self-knowledge required to confront conflict and attain higher levels of leadership performance. -Learn how to foster cultures of openness and higher accountability. -Identify the sources of dysfunctional conflict to create constructive change effectively. -Learn to use a proven, seven-step model for effectively managing and leveraging conflict. Are you ready to confront the "big elephant in the room," and manage the elephants living and thriving in your organization?